Unfortunately, there is no magic way to turn a green or black pool clear overnight ! It usually takes a lot of time, effort and money to clear up a typical "swampy" green pool. It is certainly best if you never let your pool water get this dirty, however most pool owners experience a "green pool problem" from time to time. Follow the instructions below for the best results. Remove most of the large debris from the pool floor with a large leaf net (not a hand skimmer!). This will stir up the water, and may make your pool look much worse temporarily, but the stirred up debris will settle within a few hours. DO NOT ATTEMPT TO VACUUM THE POOL IF YOU CANNOT SEE THE BOTTOM OF IT OR IF YOU HAVE A LOT OF DEBRIS ON THE BOTTOM. YOU MAY CLOG YOUR SKIMMER, FILTER OR UNDERGROUND PIPES ! Shock the pool. This means super chlorinating the water to kill off any bacteria and algae. 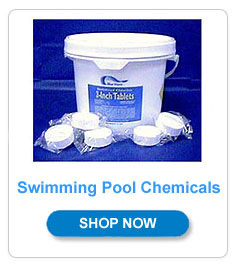 If your pool is very dirty, it may need MANY pounds of Granular Shock over a period of days before the water clears. Start off by adding 3 or 4 lbs, and if you see no results overnight, add 3 or 4 more pounds the next day. Continue this process until you notice the water changing color to either cloudy white, light green or clear. Remember to run your filter and backwash frequently during this time. Note...shock is available in liquid or granular form, we recommend using granular. It tends to be stronger and work faster than liquid. You may also want to add a high quality algaecide to the water at this point. Run your filter 24 hours a day and backwash 3 or 4 times a day for quickest results. Green or cloudy water will quickly clog a filter, therefore you may have to backwash your filter many times a day until the pool clears. THIS IS NORMAL ! Remember, you cannot over-backwash a pool filter. The more you run your pool, and the more you backwash the filter, the faster the pool will clear up. If you have a D.E. filter, remember to add new D.E. to the skimmer closest to your filter after each backwashing. A D.E. filter is more work than a sand filter, but the D.E. filter will clear a green pool about 50% faster than a sand filter. 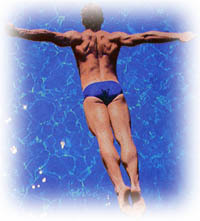 Make sure you keep the water level in the pool up as backwashing removes water from the pool. If you follow these instructions and your pool does not clear up within 4 or 5 days, your filter may not be functioning properly. If this is the case with your pool, have the filter system checked out by a professional. The pool will never clear up if the filter is not working properly ! Once the water does clear up, you will most likely see debris on the pool floor (dead leaves, algae, etc.). If there is only a small amount of debris present, you may want to vacuum it up using your own pool vacuum system. If there is a lot of debris on the pool floor, you should have the pool professionally POWER VACUUMED. This will save a lot of wear and tear to your filter system, as well as assuring that no debris gets clogged in your pool pipes. We strongly urge you to watch our most popular You Tube video, "How To Clear Up A Green Pool", where we through every step in detail for you. 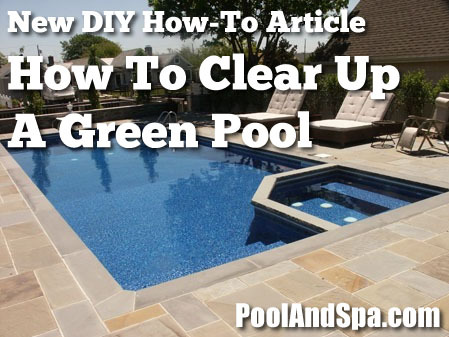 º How To Clear A Green Pool - Our most viewed video ever. Learn how to turn your pool clear! 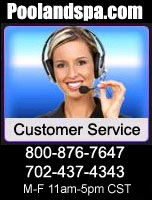 PoolAndSpa.com's Customer Service Number is 1-800-876-7647 or 1-702-437-4343.